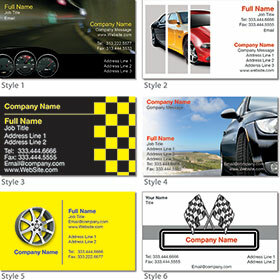 Advertise your auto dealership and yourself with our premium car dealer business cards. We have six amazing designs available. These full-color automotive business cards feature a beautiful gloss finish to give a sleek and professional appearance for your company. Customizing is super easy and there is no set-up fee required. Simply choose one of our gorgeous background styles and enter your personal or car lot information.